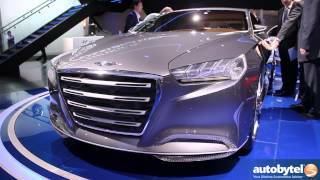 In order to keep the legacy of its previous models like Hyundai Genesis and Equus, company had to come up with something extensive. 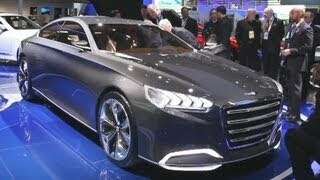 It seems they traveled a few miles over this journey at 2013 Detroit Auto Show with their HCD-14 Genesis Concept 2013. The design unveiled is undoubtedly heading towards the direction of coming premium vehicles. The Deep Vertical Grille, new headlamps and rear hinged doors carry a lot more in them to have a look upon, let us take a step ahead over this new flag holder concept by Hyundai. The double cresting wave center is definitely a treat for the eyes with same feature being used for door handles and rear headrest hoods. In the all new 2013 HCD-14 Genesis Concept fusion of analog and digital sources will help the driver to stay updated with all the required information for a safe and leisure drive. Seats look comfortable for a long ride while the new design added to the interior of HCD-14 concept makes the car’s interior more appealing. 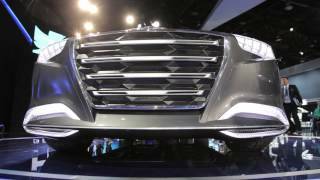 The world class fluidic-precision and liquid metal design language is what together creates the new Hyundai HCD-14 Concept. The model also received the heat extractor design accents which amalgamate seamlessly. The Vertical grille in front has been given a deeper touch to add to the class, while the white LED headlamps add more to its classy touch; the same silver strip look goes upon every inch of wheels and the front fascia. The side profile of HCD-14 2013 Concept is well dominated by the short overhangs and large diameter wheels. The rear deck is conceptualized short in the model making it different from the rest in class. For this model Hyundai has placed its latest 5.0 Liter Tau V8 Engine which features direct injection and their in house D-CVVT feature. The Engine of HCD-14 is mated to an eight-speed transmission with paddle shifters. 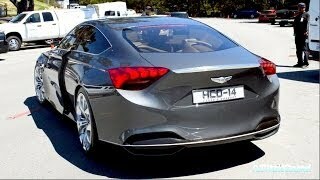 Another eye grabbing feature noticed in 2013 HCD-14 Concept is the ceramic lined exhaust system. The same is tuned for minimal back pressure and power. 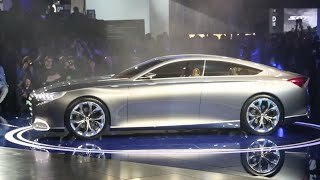 This implies that the model has been prepared keeping in mind two different segments namely, the luxury seekers and the speed lovers. Now comes the most important part, the release of prepared models and pricing of HCD-14. We would like to mention that this stunningly prepared Concept is just a concept yet you can expect the features to mark their presence in other Hyundai models.